Here’s a step that everyone has to go through when building an electric car from home. It is the process of making the racks for the battery. Why do we need battery racks for our EV? The simple reason is to hold the batteries in place. As you may already know, a homemade electric car would need from 10 to 15 units of battery. On a full charge, your EV would able to travel up to 60 – 100 miles before it has to be recharged. With that many units of battery on board, you want to make sure the batteries do not slide from side to side when you accelerate or take a corner with your EV. That will be very hazardous! Before you start making the racks, it would be a good idea to do some fittings. The type of battery recommended for electric cars are deep cycle battery. Now, how do you fit all the batteries in the electric donor car? Lets start with a mock fitting. What you want to do is find free spaces in your EV to place the battery. Take a few pieces of cardboard paper and make it into a box that is the same size (equal width, length and height) with the battery you want to use. Make about 15 cardboard boxes. This is important and you will find out why. The idea is to fit all the cardboard boxes into your electric car. Fit the boxes into the engine compartment area. Try to put them next to each other. Put a couple of the boxes into the booth at the back. If you need more space, place the boxes at the back seat. The cardboard boxes that you’ve made will represent the actual space needed for your deep cycle batteries. If all the boxes fit, you know for sure all the batteries will fit. Now that you know where to place the batteries, your next step is to make the frame of the rack. The best material to use will be “L” steel section. Cut it to size and weld them together. Drill some holes for the bolts and nuts. 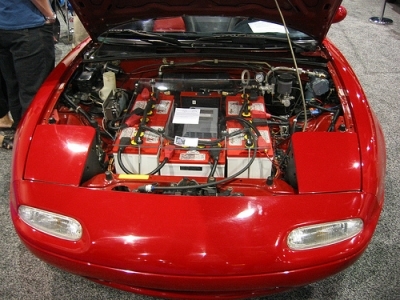 Finally, fix the rack securely to the body of your electric donor car. That should pretty much does it. Check out the following video of Gavin Shoebridge of New Zealand showing how he pre-fit the cardboard boxes and then making the frame for the battery racks for his DIY electric car. If you want to know step-by-step how Gavin converts his 1987 Mitsubishi Tredia into an electric car, check out his Electric Conversion Made Easy e-book. In his manual, there more tips and tricks on how to save money in a EV conversion project.